If your future includes a move to Lompoc, check out Meathead Movers! Our professionally trained student-athlete movers, moving concierge, and princess packers are prepared to get you safely moved into your new Lompoc home. 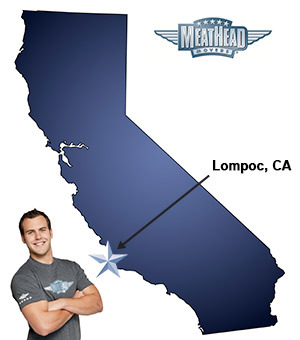 When you make your move to Lompoc, be sure to contact Meathead Movers. No matter what type of moving service you need, our student-athlete movers are ready to handle all your moving needs. Welcome to Meathead Movers of Lompoc! If you are moving to or from anywhere in Lompoc, we are the moving company for you! Our professionally trained student-athlete movers and our move concierge are here to help you with every stage of your move in Lompoc. Known as the City of Arts and Flowers, Lompoc is a beautiful place to make your new home. Take a stroll through downtown Lompoc and gaze at the nearly 40 gorgeous murals that line the streets of downtown Lompoc. Stop by local cafés and restaurants to see artwork from local residents or check out the many galleries and museums in the city to see more art. If you prefer to see natural beauty, stopping by the famous Lompoc flower fields is a must. These fields have beautiful flowers as far as the eye can see, and are in bloom from May to September. Lompoc is a beautiful place to settle down in, and with Vanderberg Air Force base nearby, the city is home to many military families. If you are considering a move to Lompoc, you should check out Meathead Movers. Our moving company specializes in local, long-distance, and commercial moves to, from, and within Lompoc. We also provide reliable packing, storage, on-site relocations, and our distinctive moving concierge service, which connects you with local service providers. All our student-athlete movers are thoroughly screened and trained before their first move. With branches not just in Lompoc, but all throughout California, we are your one-stop resource for all your moving needs, no matter where your California move takes you. In fact, you can see what your neighbors in Lompoc have to say about us. With our 100% satisfaction guarantee, the only thing you have to lose is the stress that comes from moving! So contact us today for a free no-obligation moving quote and to learn how we can help you on your next move! Moving to Lompoc? Here are some helpful resources. Alex, Keith & Cole were FANTASTIC! I truly enjoyed their delightful personalities and the exceptionally professional way in which they got my job done --- VERY QUICKLY. Thanks for offering such a great service. Always professional, efficient, careful and polite crew. Everything! Strong fast moving & organized movers. Great about checking in, scheduling options, very polite, on time. Loved it!